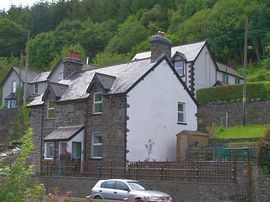 Trefriw has a number of pubs/restaurants within walking distance and village shops to get supplies from. The cottage has two bedrooms. 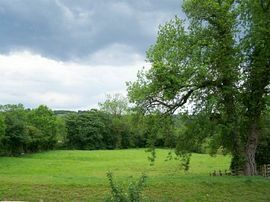 The master bedroom has a super King size double bed OR twin beds with views over fields. 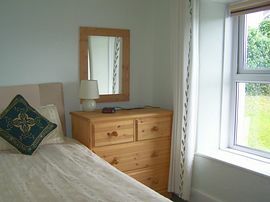 The second bedroom has a single bed and has views of the Conwy Valley. The cottage is ideal for a romantic break, families or a group of three friends. 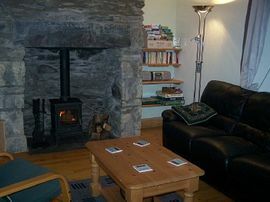 The lounge has a wood burning stove for cosy evenings, together with a colour TV and a DVD player. The kitchen is well equipped. Garden/patio has chairs and a table to either enjoy breakfast in the fresh air or to enjoy a quiet evening watching the sheep grazing. Within walking distance of pubs/restaurants. We are happy to provide a copy of our access statement on request. Garden/patio area with garden furniture. Local Services: Pubs/restaurants and village shops within walking distance. Entering the village on the B5106, the cottage is about 50 metres beyond the Princes Arms Hotel, on the right hand side. Entering the village on the B5106, go past the Trefriw Woollen Mills and straight through the village until you see a brown sign advertising the Roman Spa one mile ahead. We are about 30 yards beyond the brown sign, on the left hand side. The nearest railway station is in Llanrwst where you can catch a bus to Trefriw. The tariff varies according to season, running from: £280 per week in winter to £530 per week at peak season. 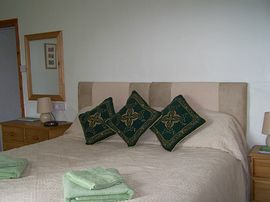 Short breaks are available from: £65 per night - £195.00 minimum. Included: Gas and electricity - no winter fuel supplements, bed linen and towels, plus basket of wood for log burning stove. Secure online booking available. Credit/debit cards accepted.